Penny Rowson has told BBC Radio Shropshire that it was amazing feeling to become the first ever female winner of the Newport Nocturne cycle race, held on Saturday, 1 September. The bi-annual Nocturne began in 1989, but this was the first year that a women's race has been part of the competition. 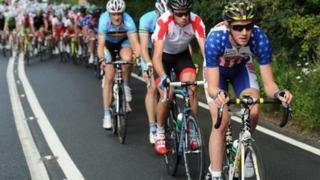 Around 14,000 spectators lined the streets of Newport to cheer on the riders, which included Olympic gold medallist Ed Clancy, who won the power-assisted Derny bike race. Meanwhile, New Zealand rider Rico Rogers won the men's race.